We’d love your help. 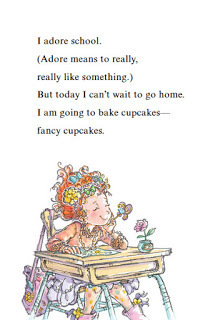 Let us know what’s wrong with this preview of Fancy Nancy and the Delectable Cupcakes by Jane O'Connor. To ask other readers questions about Fancy Nancy and the Delectable Cupcakes, please sign up. book is awesome. love it so much? This book has some fun fancy words, like "delectable", "exhausted", and "velvet"... all of which are potentially important for fancy little kids. I liked the emphasis on being a good listener in this one, and the pictures are cute, as always. We adored this book! Adore-to really, really like something.=) I think that my 2 year old daughter and I like this book more than maybe we would have if we were not cupcake fans. We just made a cake together for her birthday so she recognized some of the steps in baking. I think this would be a fun book to read and to make cupcakes in the same day. Even better a great book for your child's first bake sale. The message here is a good one, teaching about being a good listener. It is quite misleading to have this book, with words like "exhausted" and "delectable", labeled as a level 1 beginning reader. Do you like to read books that have characters that usually make mistakes? Well, I do! If you do, then I prefer you to read the book, "Fancy Nancy and the delectable cupcakes," because Fancy Nancy makes mistakes! In this book, the problem is Frenchy (Fancy Nancy's puppy) ate up all the cupcakes! Will they have time to bake more, or will the bake sale be ruined? Find out in the book whether the bake sale is ruined or they baked another batch. I think the author's message is to listen to your family or friends. Fancy Nancy and I both learned to listen to your family and friends. I like how Jane O'Connor put fancy words in a lot of describing sentences. She makes a lot of things in French because Fancy Nancy likes to speak French. I like the pictures because Robin Glasser makes everything extra fancy. When he draws, he changes the feelings on their faces. There are many other books in this series by the same author and the illustrator. I hope you read "Fancy Nancy and the Delectable Cupcakes"! Nancy is a whimsical and fun young girl who loves anything fancy, glittery, and bursting with color, but Nancy is also not a great listener. She decides to bake cupcakes for her school’s bake sale but when she doesn’t listen, disaster strikes. Luckily her dad doesn’t listen either and saves the day, bringing home more ingredients. The bake sale was a success and Nancy’s cupcakes were a hit! Excited to raise money for the school library, Nancy decides to bake scrumptious cupcakes to sell at the bake sale. (Scrumptious means very delicious.) Shopping for baking supplies, Nancy reminds Mom not to forget the sprinkles and candy toppings. No plain cupcakes for this girl! The homey scene of a family baking together is charming. Little sister is sampling the batter, mom looks frazzled, and Nancy is in decorating heaven. Disaster strikes as Frenchy, the dog, demolishes the cupcakes since Nancy didn t listen to Mom about putting the cupcakes in a safe place. Then Dad comes home carrying a bag of baking supplies for guess what? Cupcakes! Apparently nobody listens in this family since Mom and Dad both thought the other was to purchase cupcake ingredients. A new batch of cupcakes is baked and is a big seller at the bake sale. Readers will want a sweet treat by the time they finish reading. Gaudy illustrations will appeal to beginning readers who will delight in this latest installment of the Fancy Nancy. Series. A glossary of fancy words is provided for readers for vocabulary enrichment. 2010, Harper/HarperCollins Publishers, $16.99. Ages 4 to 8. Fancy Nancy is having another adventure and we get to be a part of it. It seems that Nancy is having trouble paying attention in class. But she does hear the teacher tell about the big bake sale that the school is having the next day. Nancy has big plans to make a batch of delectable cupcakes as soon as she gets home from school. On their way home, Nancy and her mom go by the market and buy all that they need including lots of sprinkles and candy to decorate the cupcakes. Nancy is very careful to listen as her mom helps her to make the batter and get it ready to put in the oven. Once the cupcakes are baked and cooled the fun begins. The frosting and sprinkles and candy go on top of the cupcakes to make them absolutely amazing! When she leaves the plate of cupcakes on the table to go to the phone to call her friend, the family dog checks out the platter of cupcakes and a big mess awaits her return. Nancy had failed to hear her mother remind her to put the plate somewhere safe from the dog. Her father comes to her rescue when he brings in a big sack of new supplies to make more cupcakes. It seems that her father has trouble listening too because her mother told him that she would get the supplies. After dinner everyone helps to make another batch of cupcakes and they are just as good as the first. The bake sale is a big success and all of the cupcakes are sold except for one that Nancy s mother saved for Nancy. O Connor s and Glasser s jovial depictions of the favorite little Nancy are a sure winner for the young readers who have become fans. They are bright and happy drawings of a very energetic little girl. Everything is full of curls, ruffles, and bright clothing. Nancy s outfits are just as fancy as her words. The list of Fancy Nancy s Fancy Words at the end of the story will help the readers to reinforce their new words learned through the story. This is a great book for girls and boys alike to enjoy and learn the importance of listening and some new words as well. Add this book to your already-owned books about Fancy Nancy and it will join the ranks of well-used books. (I Can Read!). Fiction. Grades K-3. 2010, Harper, Unpaged., $16.99. Ages 5 to 9. As mentioned in both reviews, Nancy and her adventures are depicted with whimsical, colorful illustrations that will no doubt engage young readers. A great feature, the book uses parentheses and a glossary to help young readers learn new and “fancy” words. The theme of listening is discussed in a cute and enjoyable way, that will delight early readers and parents alike. This is an outstanding representation of an early reader. The words and sentences are not dull or painfully simple, yet are challenging and exciting. Nancy loves to use fancy words, and readers will love learning to use them too. Parentheses providing definitions, as well as the a glossary in the back of the book, are helpful tools to aid in comprehension of the fancy words. The illustrations are whimsical, engaging, and representational of the words on the page. They will also aid in comprehension as young children learn to read. Not your traditional early reader, Fancy Nancy has easily readable fonts, few sentences per page that never roll over to the next, and has a plot that is appealing to young boys and girls. Opening line/sentence I adore school. Brief Book Summary This book in the Fancy Nancy series is about Nancy being so excited to bake for her schools bake sale. The bake sale is to raise money for library books. Nancy wants to make the cupcakes extremely pretty. She works very hard to follow the directions in order where she knows her teacher will love. Her neighbor loves the cupcakes she made. All of the sudden her dog eats the cupcakes and they are all missing. Her dad has ingredients because he thought he was supposed to buy them too. She makes the new cupcakes by herself and they become a hit at the bake sale. Fancy Nancy is having another adventure and we get to be a part of it. It seems that Nancy is having trouble paying attention in class. But she does hear the teacher tell about the big bake sale that the school is having the next day. Nancy has big plans to make a batch of delectable cupcakes as soon as she gets home from school. On their way home, Nancy and her mom go by the market and buy all that they need including lots of sprinkles and candy to decorate the cupcakes. Nancy is very careful to listen as her mom helps her to make the batter and get it ready to put in the oven. Once the cupcakes are baked and cooled the fun begins. The frosting and sprinkles and candy go on top of the cupcakes to make them absolutely amazing! When she leaves the plate of cupcakes on the table to go to the phone to call her friend, the family dog checks out the platter of cupcakes and a big mess awaits her return. Nancy had failed to hear her mother remind her to put the plate somewhere safe from the dog. Her father comes to her rescue when he brings in a big sack of new supplies to make more cupcakes. It seems that her father has trouble listening too because her mother told him that she would get the supplies. After dinner everyone helps to make another batch of cupcakes and they are just as good as the first. The bake sale is a big success and all of the cupcakes are sold except for one that Nancy s mother saved for Nancy. O Connor s and Glasser s jovial depictions of the favorite little Nancy are a sure winner for the young readers who have become fans. They are bright and happy drawings of a very energetic little girl. Everything is full of curls, ruffles, and bright clothing. Nancy s outfits are just as fancy as her words. The list of Fancy Nancy s Fancy Words at the end of the story will help the readers to reinforce their new words learned through the story. This is a great book for girls and boys alike to enjoy and learn the importance of listening and some new words as well. Add this book to your already-owned books about Fancy Nancy and it will join the ranks of well-used books. (I Can Read! I found these two reviews to be a great reflection on the Fancy Nancy book. For this book being an early reader and not having a lot of elements, each review was very thought out and explained the main idea of this book. I also liked for the first review that it talked about the vivid illustrations that readers will love seeing while reading the words. Also, I liked that it highlighted on Nancy’s advanced “fancy” vocabulary. She speaks very fancy for a young girl and this is a common trend in all of her books that readers love seeing. For the second review they gave an extremely descripted response to the plot of the story. I like that it brought up that boys will even like the importance of listening to this story, because many people would assume boys wouldn’t like this book. However, it is a fun and suspenseful read for young kids that it doesn’t matter about gender. After reading this review it made me appreciate the value of this early reader where it would be essential in a young child’s classroom. Fancy Nancy and the Delectable Cupcakes is a great early reader for students who are beginning to read on their own. There are minimal words to a page and it is on a topic about a bake sale that children will enjoy. In addition, the plot is very straight forward with a great lesson that things don’t always go smoothly, but don’t give up. This is very realistic to young children and they will appreciate this story line. Children will feel confident when they understand many of these simple words, but might struggle on some of Nancy’s “fancy” terms. However, if they read it with a parent, classmate, or teacher they could easily understand these words and feel confident when reading this story. Fancy Nancy has become a phenomenon in recent years. Starting as a young children’s book it has became a movie, early readers, chapter books, toys, and many more. This is something that is so big in children’s literature. It could be controversial because people think that there isn’t really a point to it. However, it has become so well liked in recent years that it would be a good addition at some point in the school year. There are many Fancy Nancy early readers that children from the grades Kindergarten- second should have access on in the classroom. As a teacher I would bring in many of these early readers and have the children during independent reading time read whichever one they want. The teacher will have many copies of all of these books. While the child is working independently, the teacher will pull aside children individually and will assess their reading. These early readers are great ways to assess how a child is doing with independently reading. From there this will show the child’s ability and what to do to improve. Fancy Nancy’s class is having a bake sale and she is eager to make cupcakes for it. Fancy Nancy struggles to be a good listener, however, and her dog, Frenchy gobbles up all of the lovely cupcakes when Fancy Nancy leaves them in her reach. Fancy Nancy’s dad comes to the rescue with new ingredients, however, and they make new cupcakes as a family that evening. By the conclusion of the short story, Fancy Nancy’s cupcakes have been a stellar hit at the bake sale and the reader has learned a handful of new, fancy vocabulary. Fancy Nancy is having another adventure and we get to be a part of it. It seems that Nancy is having trouble paying attention in class. But she does hear the teacher tell about the big bake sale that the school is having the next day. Nancy has big plans to make a batch of delectable cupcakes as soon as she gets home from school. On their way home, Nancy and her mom go by the market and buy all that they need including lots of sprinkles and candy to decorate the cupcakes. Nancy is very careful to listen as her mom helps her to make the batter and get it ready to put in the oven. Once the cupcakes are baked and cooled the fun begins. The frosting and sprinkles and candy go on top of the cupcakes to make them absolutely amazing! When she leaves the plate of cupcakes on the table to go to the phone to call her friend, the family dog checks out the platter of cupcakes and a big mess awaits her return. Nancy had failed to hear her mother remind her to put the plate somewhere safe from the dog. Her father comes to her rescue when he brings in a big sack of new supplies to make more cupcakes. It seems that her father has trouble listening too because her mother told him that she would get the supplies. After dinner everyone helps to make another batch of cupcakes and they are just as good as the first. The bake sale is a big success and all of the cupcakes are sold except for one that Nancy’s mother saved for Nancy. O Connor s and Glasser’s jovial depictions of the favorite little Nancy are a sure winner for the young readers who have become fans. They are bright and happy drawings of a very energetic little girl. Everything is full of curls, ruffles, and bright clothing. Nancy’s outfits are just as fancy as her words. The list of Fancy Nancy’s Fancy Words at the end of the story will help the readers to reinforce their new words learned through the story. This is a great book for girls and boys alike to enjoy and learn the importance of listening and some new words as well. Add this book to your already-owned books about Fancy Nancy and it will join the ranks of well-used books. Excited to raise money for the school library, Nancy decides to bake scrumptious cupcakes to sell at the bake sale. (Scrumptious means very delicious.) Shopping for baking supplies, Nancy reminds Mom not to forget the sprinkles and candy toppings. No plain cupcakes for this girl! The homey scene of a family baking together is charming. Little sister is sampling the batter, mom looks frazzled, and Nancy is in decorating heaven. Disaster strikes as Frenchy, the dog, demolishes the cupcakes since Nancy didn t listen to Mom about putting the cupcakes in a safe place. Then Dad comes home carrying a bag of baking supplies for guess what? Cupcakes! Apparently nobody listens in this family since Mom and Dad both thought the other was to purchase cupcake ingredients. A new batch of cupcakes is baked and is a big seller at the bake sale. Readers will want a sweet treat by the time they finish reading. Gaudy illustrations will appeal to beginning readers who will delight in this latest installment of the Fancy Nancy. Series. A glossary of fancy words is provided for readers for vocabulary enrichment. I agree entirely with the content of both reviews—Fancy Nancy is a jovial delight! Not only does the author succeed in exemplifying why it is important to be a good listener, but introduces new and more difficult vocabulary to young readers in a manageable way. The illustrations could not be any more lighthearted and sweet, making this a literary experience all readers are bound to enjoy. The notably larger text is purposefully designed for early readers and is accompanied by heartwarming watercolor illustrations that will appeal to the intended audience. The introduction of each new word is followed by a simple definition provided in parentheses, providing clarification for readers, most of which will need it. The last page of the book reviews the vocabulary words introduced throughout the course of the story and again provides respective definitions so that readers can revisit what they learned while reading. Fancy Nancy and the Delectable Cupcakes is level 1 young readers picture book. This is intended for readers ages 6-8. This story is simple cute story about Nancy preparing to make cupcakes, she buys all the ingredients and makes the cupcakes and is so excited ... and then her dog eats them! Oh no what will she do?? This story is cute and illustrated very well, Nancy the character is a cute relatable corky little girl , who often tries very hard at things until they go wrong and then she problem s Fancy Nancy and the Delectable Cupcakes is level 1 young readers picture book. This is intended for readers ages 6-8. Will I review every Fancy Nancy story we read? Aren't they all essentially the same? Why does my daughter love Fancy Nancy so much? Is it weird that she can "read" a Fancy Nancy book because she can apparently memorize every word after one listen, but claims she can't read sight word flashcards because they are "too hard"? I will add here that one thing I really appreciate about the endless adventures of Fancy Nancy is that she's a nice kid. The humor is never about being bratty or snarky. This book was an I Can Read about Fancy Nancy’s bake sale and cupcakes. My favorite part was when Frenchy ate Fancy Nancy’s cupcakes because it was funny! The pictures really help to tell the story. I like this book very because it was funny and it made me hungry! Girls who are between 5-12 would like it. What a fun way to get beginning readers engaged and excited about reading. This book was fun, had a good story and was a great way to incorporate a well-known character like Fancy Nancy into an early reader book! I also loved the illustrations and thought that they were a great help contextually for children who are beginning to read. Great book for kids who are just learning to read with it's easy words and shorter sentences. I thought it was a cute book and very entertaining for young kids. Cute little girl book which has "fancy" words! Fun and Easy to read! Keeps a young girl looking at all the fancy pictures! The school bake sale is coming up, and Fancy Nancy is planning to bake cupcakes to sell. The only thing is, she forgets to follow one of the steps. This review has been hidden because it contains spoilers. To view it, click here. Loved the fancy words. Fancy Nancy and the Delectable Cupcakes is about a little girl, Nancy, who is helping her mom bake cupcakes for the school bake sale. The backing goes as planned and the cupcakes come out wonderfully. However, then Nancy places the cupcakes on a table where the dog eats them and they have to make the cupcakes all over again. Fortunately Nancy's dad brings home ingredients for cupcakes thinking he was supposed to pick them up and so they make them all over again. The main theme/lesson in the book Fancy Nancy and the Delectable Cupcakes is about a little girl, Nancy, who is helping her mom bake cupcakes for the school bake sale. The backing goes as planned and the cupcakes come out wonderfully. However, then Nancy places the cupcakes on a table where the dog eats them and they have to make the cupcakes all over again. Fortunately Nancy's dad brings home ingredients for cupcakes thinking he was supposed to pick them up and so they make them all over again. The main theme/lesson in the book is about listening. At the beginning Nancy has to apologize to her teacher for not listening and making her teacher repeat herself. She does a good job of listening to her mother when making the cupcakes but does not listen to her mom when she tells Nancy to put the cupcakes in a safe place. And then at the end Nancy's father comes home with ingredients, both parents had said they would buy the ingredients and didn't listen to each other so both of them bought ingredients. This is an important lesson for children to learn. If they don't listen chaos can ensue. Fancy Nancy and the Delectable Cupcakes is a beautifully written book for young readers, specifically great for a little girl with a big personality. Fancy Nancy is baking some cupcakes for her school's upcoming bake sale. Things are going perfect until her mischievous dog, Frenchie, decides he wants a taste of Nancy's cupcakes. This book is very appealing to young readers because of its simple word choice and small sentences. The author, Jane O'Connor, likes to define words within her story lin Fancy Nancy and the Delectable Cupcakes is a beautifully written book for young readers, specifically great for a little girl with a big personality. Fancy Nancy is baking some cupcakes for her school's upcoming bake sale. Things are going perfect until her mischievous dog, Frenchie, decides he wants a taste of Nancy's cupcakes. This is a fun story about making cupcakes, but also about listening. I like that these stories incorporate a little bit of vocabulary, a little lesson and a lot of girly frills. Nancy cooks with style and flair and the illustrations are so expressive - you know exactly how she is feeling. We've really enjoyed the books in the Fancy Nancy series and always grab a new one at the library when we see it. We've read this one a couple of times. May it's because we are planning for birthdays and have cupcakes on the brain. I'm sure it doesn't help that a brand new cupcakery just opened up in town... No matter what this was a great read for us. Nancy is participating with her class in a bake sale and learning the importance of good listening skills. While I'm more of the mind that French, the poodle, was the one with dismal behavior (dismal is a fancy word for extremely bad :) ) it is true that Nancy was not listening, but I bet she will May it's because we are planning for birthdays and have cupcakes on the brain. I'm sure it doesn't help that a brand new cupcakery just opened up in town... No matter what this was a great read for us. Nancy is participating with her class in a bake sale and learning the importance of good listening skills. While I'm more of the mind that French, the poodle, was the one with dismal behavior (dismal is a fancy word for extremely bad :) ) it is true that Nancy was not listening, but I bet she will next time! We've read several Fancy Nancy books and this is one of the better ones. However, it's labeled as a "Beginning Reader" meaning it has "simple sentences for eager NEW readers". I don't agree. To me, a new reader is still reading shorter sentences and easier words. This book has quite a few sentences per page for a new reader and some of the words aren't words that most early readers know (but I guess they can sound them out) like definitely, delectable, exhausted, success. O'Connor, J. "Fancy nancy and the delectable cupcakes". (2010). New York: Harper Collins. This is an easy reader about a character named Fancy Nancy. They are having a bake sale at school. Fancy Nancy bakes cupcakes. She doesn't listen to her mother when she tells her to put them up, and the dog eats them. Luckily, Fancy Nancy's father thought he was supposed to get the cupcake ingredients. She is able to remake them, and this time she listens to her mother. I really like the Fancy Nancy books because I like how new words are introduced and have a vocabulary list called "Fancy Nancy's Fancy Words" at the end. With her mom's help she remembers to follow directions for delectable cupcakes except Nancy forgot to listen to one of her mom's very important instructions that could ruin Nancy's cupcakes. I used this cute book to teach my students the cafe strategy, Tune into Interesting Words. We read the book but stopped at words my students felt were interesting or didn't know what they meant such as delectable, aroma, repeat, and velvet. They enjoyed the plot line as Fancy Nancy was so excited about the bake sale. I enjoyed sharing it with them. This review has been hidden because it contains spoilers. To view it, click here. Another fun Fancy Nancy book! Nancy bakes some Nancy cupcakes for the bake sale that her school is holding. But because she does not listen Frenchy (the dog) eats them all! Luckily her parents are not so good at listening and Nacys father comes home from work with ingredients to make cupcakes also. At the bake sale they are a big success! Nancy has been having a little trouble paying attention in class--but when it's time to get ready for the school bake sale, she is all ears. With Mom's help, Nancy remembers to follow all of the directions for a delectable batch of cupcakes . . . except for one very important detail! Subject: Baking -- Juvenile fiction. Fancy Nancy has become a good series of books for my 2 year old granddaughter and I to read. I like them due to the storylines but also it introduces 'bigger' words and has the definition for them under like "improve, Improve is fancy for getting better at something." Love that they do this.